This post is inspired by a lively discussion I had on Facebook the other day after telling my friends that I’d challenged myself to pack for a two-week Eastern European Viking river cruise in nothing but my 19-inch Delsey Chatelet carry-on. In the spirit of sharing, here’s exactly how I did it. In other words, here’s how to cram 52 items into a carry-on that’s about the size of my cat (photo evidence below). To begin with, I needed to actually think through my itinerary, something I rarely do when I travel (I know, I know…). My usual process is to dump a bunch of clothes I like wearing into a suitcase and then sit on the poor overstuffed thing to try and zip it up. Anyone who knows me personally knows this to be true. So for this trip, I looked at the average weather in each country I’d be visiting – Romania, Bulgaria, Serbia, Croatia, and Hungary – and then thought about what I’d actually be doing there. Temps would be ranging from a chilly 55 to a balmy 89. Because I was traveling with Viking, I knew I’d be doing a lot of walking on the city tours, so I knew I’d need some city-appropriate clothes with sleeves (for cathedrals, synagogues, and the like). I’d also signed up for a couple of excursions to the Croatian and Bulgarian countrysides, too, so I knew I’d need some comfortable, warm-weather clothes with good hiking shoes. From past experience, I also knew I wouldn’t need a lot of formal clothes or high heels, as the dress code tends to be incredibly informal on river cruises. I perused my closet and decided on a color scheme: monochromatic with a splash of pink. Why pink? Who knows…I pulled out a pink top with polka dots and thought it’d be cute for a city walk, so I decided to base things around that. Then, the hard part: anything that didn’t match this color scheme didn’t make the cut. Here’s everything, laid out, so you can see exactly how everything fit together. As you can see, I could pair any shirt with any pair of pants and any pair of shoes. Four splashes of pink helped to “lighten up” the greys, blacks, and blues. And here’s how I got it all into a 19-inch carry-on. Then, I moved over to the other side. Because there’s a locking mechanism and two poles running down the length of the suitcase, this side is a little trickier. I started by rolling up my pants and cardigans and lined the sides with those. In the middle, I folded my sweaters. On the outer edges, I rolled up the romper and the bathrobe. Once everything was in, I peppered the socks around the edges wherever there was room. Then, I folded up the jean jacket and laid it flat on top of everything. All the underwear, bras, and bathing suit went into the zipper pouch on the other side. I left out the other jacket, the scarf, the yoga pants, a black t-shirt, and the tennis shoes–I wore all of this stuff on the plane. The last step was to toss in my hairbrush, makeup bag, and toiletry kit. I knew from sailing with Viking before that I wouldn’t need a hair dryer (thank goodness, as I have no idea how I would have fit that in here), so I found it pretty easy to cram all the bathroom stuff in there. Then, all I had to do was zip it up. AMAZING. I NEVER, EVER thought that 1) I could be so discerning and well-planned with my packing, or 2) that I could pack that much stuff into one tiny suitcase. I used almost everything–the romper never made it out, sadly–and I was really happy that I’d brought two jackets and a couple different kinds of tops. Because Viking is a really casual cruise, I knew I wouldn’t need a lot of fancy clothes, so I really cut back on the “nice stuff” this time around. As I suspected, I only needed one nice cocktail dress for my aloha dinner with Ryan in Budapest. Was it a perfect list? Not completely. I would do a couple of things differently next time. For one thing, I’d bring an extra pair of jeans, as it was cooler than I thought it would be and ended up wearing those jeans probably eight or nine out of twelve days. I’d also bring more underwear, just so I’d have a few extra pairs, and would probably leave the bathrobe at home (I only wore it a couple of times on lazy mornings in our cabin). Also, I’d probably take out one cardigan and add in two more t-shirts to give a little more variety to what I wore on top. Things were feeling a little repetitive by day ten…. Anyway, thanks to Delsey, I think it’s safe to say I’ve changed the way I pack forever. No more cramming a million clothes that I think I *might* need into a giant suitcase that will almost always weigh more than 50 pounds, leaving me tossing out items at the last minute at the airport. Those days are SO over. From now on, it’s lightweight traveling for me! Do you have any packing tips that have worked for you? I’d love to hear them!! I’m in love with a new suitcase. If you know me, this won’t surprise you, as I’ve been carrying around one suitcase or another for the past ten years, but the story of how I became a suitcase girl is a little more interesting (more on that in a second). But first, what do I love about my 19-inch champagne-colored Delsey Chatelet suitcase, this new little love of mine? For one thing, the size: it’s the international carry-on size (which means, to my delight, that it will fit in the overhead compartment (and under the seat) of almost all international airlines). Also, like all of Delsey’s Chatelet collection, it features a TSA-friendly combination lock (which means that airport authorities can still open and rummage through your bag with a special key if needed but that a normal person can’t open your suitcase). And, it has these nifty spinner wheels you can lock so your suitcase won’t roll away from you if you’re standing on an incline. Yes, this has actually happened to me before (thanks, San Francisco). It’s rounded shape is also adorable. Over the years, a lot of my friends and fellow travelers have looked at me with skepticism when I’ve arrived, suitcase in tow, instead of toting around a large backpack on my shoulders. What they don’t understand is that I’ve always been a suitcase kind of girl. When I was twenty-two years old, my parents did what most supportive, loving parents do when their child graduates college: they bought me a graduation present. But it wasn’t a briefcase, a suit, a plaque, or a new laptop computer, the kinds of sensible gifts my friends and colleagues at school were getting. It wasn’t jewelry, a commemorate necklace, a class ring, or a fancy diploma frame. My parents knew me well: they bought me three pieces of blue luggage. The afternoon of my graduation, my dad rolled the big one out into our family’s living room and presented it to me with gusto. He called it “big blue,” the same name bequeathed to my roommate Mary’s eponymous couch that followed us through four apartments. The day before, we’d given the couch—along with a bunch of other stuff I didn’t know what to do with—to the pizza delivery guy who, delivery box in his hands, saw us moving out and confessed he’d just moved to town and didn’t yet have any furniture. Dad had even tied a big red bow to the top of it, where my hand would, for so many years, press down and lift up on the retractable handle. Inside, he’d piled in the smaller pieces like Russian matroyshka dolls, all zipped up into each other. I gasped in joy and pulled each one out, lovingly, running my fingers along the strong navy blue cloth and imagining the world at my twenty-two year old feet, the world that had become increasingly larger during my college years after I discovered what happened when a single girl goes out into the world. (In case you’re wondering, magical things happen). Later that evening, once the flurry of the celebrations had given way to contemplation, I sat in my room, opened my mom’s card to me, looked at the three blue suitcases, all lined up like my little army in my childhood bedroom, and let my eyes well up with tears. In her elegant, curly handwriting, my mom had written a line from a hymn she’d repeated to me many times since I’d left home to pursue a college life four years ago: roots hold me close….wings set me free. Though I’d suspected it before, I knew it, in that moment, to be true: my life was never going to be the same. That fall, this Southern girl from Georgia took a leap of faith and moved with all of my new luggage to Cartagena, Colombia to teach English. When I got there, wide-eyed and surprised that I’d actually done it, I opened each one to find letters and cards from my family nestled inside the t-shirts, pant legs, and tucked into the insides of my shoes, telling me how excited they were for my new adventure. A few years—and a lot of travels—passed. In the meantime, I returned home to the U.S., moved to Tucson, Arizona, met my husband-t0-be, and stayed there eight years. I left home with nothing but those three blue suitcases, all of which I hauled on the plane with me and my dad. I went to graduate school for creative writing, I started teaching, I decided to keep on going until I reached the furthest point I could really go in my academic life—to get that elusive Ph.D. after my name—and I traveled a lot as a solo female traveler. I took my blue suitcases everywhere, even after they started looking heavier and clunkier than the newer, sleeker models with their rolling wheels and lightweight aluminum bodies, even after the TSA changed the weight limit to 50 pounds and rendered the giant one effectively useless. They tread over continents, rolled over cobblestones, highways, and side streets, and sat in many a cargo pit. The dark cloth, thick zippers, and leather flaps over the corners stayed intact and never weathered. I know the stereotype: the girl who totes around a suitcase leaves for her travels burdened. She isn’t really devoted to the cause. She’s a tourist, not a traveler. She packs too much (which, ok, yes, is true in my case). It’s the backpacker who deserves our respect: she’s the one who doesn’t care if her toenails are painted, if she remembered to pack her favorite perfume, if her shoes would look right with the pants she packed. She sports sandals with straps, leaves the makeup at home, and can wear and re-wear the same outfit twenty-five times if she needs to. I tried taking a backpack with me once, borrowing my friend Leen’s on a trip from Ghent to Amsterdam to visit friends, but I simply couldn’t convert—all my clothes got crammed into weird places in the pack and everything came out wrinkled and flat. Together, we took trains all over Europe; we stayed in hostels, on floors, and in hotels; we hopped around unencumbered. And at the end of it all, I was still in love with my three blue suitcases. But then, in 2013, someone took a very large knife and hacked open our outdoor storage shed. He stole all of my luggage, inside of which were all my summer clothes, and dumped the clothes onto the street before running away with all three bags. For a while after that, I was too scared to buy any nice luggage, so I bought a $19 carry-on from the clearance rack at Wal-Mart. A few months later, after it fell apart, I asked for a new suitcase for Christmas—and my parents came through again with a gorgeous, lightweight 26-inch baby blue number, one that, even though it has a bent zipper and a tear in the front, I still carry with me today. In March of this year, exactly ten years after I took that first trip to Colombia, I taught a writing workshop at the Women in Travel Summit in Irvine, California and found myself swapping suitcase tales and packing tips with a new friend of mine as we walked through the conference tables. By the end of the conference and after walking by the Delsey Luggage table about 600 times, I decided to celebrate the fact that ten years later, I was still taking off, flying solo–while balancing a husband and an academic job–and relishing in my bag of belongings chasing behind me instead of piled up on my back. After all, I’m still that girl. I took one home, convinced it would completely change the way I packed. I was smitten with the sleekness, the sophistication of the lines, the ease with which the suitcases rolled around the floor, the locking mechanisms, the lined compartments inside. I was even smitten with the idea of a sophisticated piece of luggage, something that would announce my presence before I even came running down the terminal. Something that would dance to the tune of those of us who, despite our wanderlust and freedom-seeking ways, love the feel of a handle in our hands and not a strap around our waists. Something that acknowledged my twenties and said a proper hello to my thirties. Plus, at $230, it’s not exactly a suitcase I would have planned on purchasing for my past self anyway–like a sturdy purse or a well-made pair of pants, this is a true travel investment. “What do you think?” I asked my husband Ryan, spinning it around on its delicate heels and whirling it in his direction. Of course, Ryan is right—I honestly have no idea how I’m going to pare things down into a 19-inch carry-on for trips longer than a few days. But, I leave for two weeks in Eastern Europe with Viking River Cruises next week, and you know what? This girl is going to do it. I’ve got a wedding to attend in Tucson, Arizona next week, so I’ll do a quick test run and let you know how things go. In the meantime, if you’re interested, they’ve got a 50% off sitewide sale at the moment and are offering free shipping–lots of cute bags and suitcases to choose from!). A special thanks to Delsey Luggage for providing me with a 19-inch Chatelet carry-on for purposes of writing this story. Right now, you can purchase one on sale for $230 using the links above! So, what happens when two bargain shoppers who love a good challenge head to Russia for two weeks? Sort of. I mean, it’s not like my mom and I came home toting extra suitcases full of souvenirs we’ll never look at again, or that we came home saddled with bags stuffed full of cheesy tourist souvenirs made of plastic. During our two weeks on our Viking River Cruises Waterways of the Tsars trip, we shopped carefully, compared prices, kept our eyes on certain items we knew we wanted, and learned some critical Russian phrases to help us when speaking with local shopkeepers and the artisans in the open-air markets. The Viking staff recommended the best markets for bargaining, the best for getting a good price, and the best for finding unique or hard-to-find artisanal products. We took all of their recommendations, zipped up our purses, put on our good walking shoes, and hit the markets everywhere we went. Here’s what we came home with, complete with the price we paid (roughly translated to American dollars) and where we bought it. As always, shop local, know how to spot imposters or fake products, and make sure to support ethical working conditions for the artists by finding out who made the items you’re buying. Enjoy! The first set of Russian nesting dolls surfaced in the 1890s by Russian carpenter Vasily Zvyozdochkin, and since then, the matroyshka (or, “matron”) dolls and daughters have become iconic to the country of Russia. Make sure to avoid the mass-produced ones that were painted by machine, unless you don’t care how they dolls were made. The hand-painted ones will likely be signed by the artist on the bottom of the biggest doll and will likely have imperfections, some dripped paint on the insides, and personalities all their own. Because I bought my dolls on my first day in St. Petersburg (oh, the newbie! ), I’m pretty sure I bought machine-painted ones…. This was something my mom debated for a long time about buying. A chinchilla scarf isn’t something she’d normally have in her closet (who would? ), but after we walked up and down the Uglich open-air market, she kept coming back to the soft, rabbit-like fur scarf on the rack outside a small clothing store’s kiosk. Though there were many markets selling chinchilla scarves around Russia, she was particularly drawn to this one because it had a sweet rose in the center and it was just long enough to be stylish but not overbearing. After a little bit of negotiating (you’re welcome, mom! ), the seller agreed to sell it for 2090 rubles (about 32 USD). She’s absolutely thrilled with it and had no buyer’s remorse whatsoever, so I’d say that regardless of whether or not it’s real chincilla, a rabbit, or faux fur, this is one souvenir that’s going to get a lot of face time in the winter. I love the story behind the Father Frost statues, because it demonstrates–at least for me–the resilience and power of language in the face of religious prosecution and political oppression. (And yes, they’re also really cute). In the early years of the Russian Revolution and the establishment of the Soviet regime, Christmas traditions were obliterated, arguably due to their alignment with religious, bourgeois society and Western influence. Even displays and depictions of Ded Moroz, the non-denominational Russian wizard of winter (commonly known in English as “Father Frost”), were banned, likely due to being too closely aligned with Western ideologies and the American version of Santa Claus. However, a decade later, in the 930s, Stalin reintroduced the cultural icon of Father Frost throughout the Soviet Bloc as a way to inspire nationalism and instill a sense of cultural pride in its citizens. In terms of what to look for, it’s most common to see the Father Frosts wearing outfits of snowy scenes filled with snow maidens, angels, children, and traditional Troikas (three horses pulling the ubiquitous sleigh). Though this is somewhat controversial, some towns have even gone so far as to “Westernize” their pieces, adding in scenes of the American version of Saint Nicholas, aspen Christmas trees decorated with balls and ornaments, nicely-wrapped presents, and families sitting around a fire in a living room reading books or drinking hot chocolate. Lacquer boxes (perfect for storing jewelry or keys) is a popular Russian souvenir. Basically, they started being produced after the Revolution by unemployed artists who formally created religious art and icons to supplement their loss of income. After the fall of the Soviet Union, perspectives on religion were compromised and, quite frankly, pretty negative, so the artists began thinking about what people would like to buy and decided to start producing small colored boxes with lids displaying images of Russian life, architecture, and landscapes that could be sold to children, tourists, and women. It’s a labor-intensive process, with each layer on the boxes being painted individually and requiring a lengthy drying time. This means that a single box can take months to make…and now, as the buying demographic has shifted to tourists, it also means that the boxes are incredibly expensive. A hand-carved, hand-painted lacquer box can cost upwards of $100. A counterfeit one, on the other hand, can be as cheap as $5-$10. As you can see by the price I paid above, I am quite sure I bought a counterfeit one, but I really, really needed something to hold my ring when I go the gym, so I bought one. And even though it’s not authentic, I love it. First things first. Russians love tea. They are not a coffee-drinking culture (I didn’t know this until I got there), but rather a tea-drinking one. According to legend, more than 85% of Russians drink tea every day. I have no idea where this statistic comes from, so take it as you will, but even still: that’s a pretty hefty number of daily tea drinkers. I bought a little bag of homeopathic tea from a sweet young girl dressed in traditional Russian clothing in a very touristy-trap kind of place, but I have to admit: the tea is spectacular. I bought it not because I had to have the tea, but rather because the girl and I had such a lovely time talking with each other that I couldn’t resist buying something. The tea is handmade in Mandrogy, and the young shopkeeper and her husband (along with their one-year-old baby) live there year-round, cultivating the tea for half the year and selling it to tourists for the other half. I’ve been drinking the tea, which has lots of lemongrass and mint in it, in the mornings when I’m writing, and it’s wonderful. I’ve been brewing three cups from the same leaves! My mom bought this shawl from an open-air kiosk in downtown St. Petersburg. I don’t know much about scarf culture in Russia, but I can tell you that shawls are pretty ubiquitous here. Nearly every city we visited was selling them, so if you’re into pretty decorative pieces for your fall and winter wear, I highly suggest one of these beauties 🙂 Thanks for the photo, mom! Now, I know I said above that it’s not like I toted home a whole extra suitcase full of souvenirs here, but when it comes to the Kremlin Vodka, I almost wish I had. For one thing, it is SO AFFORDABLE in Russia – I bought an entire bottle for my husband from a supermarket in Moscow for less than $20. Here in the States, you can find it, but if you want to buy it, the same exact bottle sells on the internet for nearly $75. Secondly, my husband Ryan absolutely LOVES it. Though he’s no real connoisseur of the stuff, he told me that this vodka is the best vodka he’s ever had, period. Talk about a successful gift! Similarly, the little faux-leather flask I bought Ryan to go along with the vodka was a nice addition. I bought it in one of the gift shops on Kizhi Island, particularly because I love the word Kizhi on the front and the embossing of the Church of the Transfiguration. Ryan loves it, too, because he can now drink his vodka stealthily and in secret, no matter where he is…. A special thanks to Viking River Cruises and the staff on the Viking Truvor for hosting our stay and for making sure I knew what to buy when it came to supporting the local Russian economy! As a writer, I’m inevitably hard-wired to relish in process. Drafting. Revision. More drafting. More revision. Some editing. Another revision…. This life–and vocation, in a sense–requires a lot of bad drafts, a good bit of patience, and a certain loving-kindness toward ourselves and trust that the process will take us where we eventually need to be. So with that, I introduce the evolution of this new-fangled logo in all its beautiful messiness. May it inspire you to revel in the disasters (and joys) that come along with creating beauty in a chaotic world. When I first decided I wanted to create a new logo, I knew I needed to do some investigating. What did my other travel writing friends do with their logos? What makes a good logo, anyway, for a blog that’s mostly travel? Lots of Eiffel Towers, suitcases, noodle dishes, mountains, mountain climbers, wine glasses, passports, globes, compasses, old maps, new maps, airplanes, boats, cars (transportation of any kind? Check.) cameras, and stamps. It’s cute, right? But not exactly whimsical. Beautiful. Wistful. Inspiring. And not a thing to do with traveling (metaphorically or physically, as the case may be). Too much eating and snapping Instagram photos. In a word (or two)? Not quite. Plus, that “B”…. So, I enlisted the help of the fabulous Krystyn (we’re both from the forested, lovely lands of north Georgia and we both share unusual spellings of our shared name) of Krizzy Designs, and we went back to the drawing board. Though she’s the one who does my coding, I needed a second opinion on the design. She asked me: What, exactly, was I trying to do with this blog? Why was I interested in moving away from blogging on my personal portfolio site, www.kristinwinet.com, and creating a new kind of identity? Well, the answer was pretty easy: I’m not famous. My first book isn’t published (yet, yes?) and my professional life is still taking unexpected and surprising directions (for one, who ever thought I’d be getting a Ph.D.?). I’m a freelance writer, a dabbling photographer, an occasional guest speaker, but blogging there just didn’t feel right. So, I figured: everybody else has a blog name, so why shouldn’t I? Krystyn and I got to work. I did exactly what I do with my technical writing students, trying, in a sense, to practice what I preach, semester after semester (white space is not your enemy! simplicity is key! no more than 3-5 colors! etc….) I sketched out messy thumbnails of what I was imagining (operate word here being messy), threw together some ideas, downloaded a whole bunch of fonts I loved from Creative Market, and then wondered exactly what I was going to do with all of those fonts. But that wasn’t really going to work as a header because it was too round and too….skinny. And I liked the white space and the purple, but I didn’t feel like the typography was quite right. I really liked the idea of this font, but something about the “o” was bugging me. And then my husband Ryan (who, yes, is an Illustrator virtuoso himself) told me I needed to simplify. No weird “type on a path” text, he said. And then my sister and brother-in-law chimed in and told me I needed some travel flair. And then Krystyn told me we should put dots between the words, because although they’re great together, they’re just as amazing, each one, one their own. And that, my friends, is how this whole business got started. 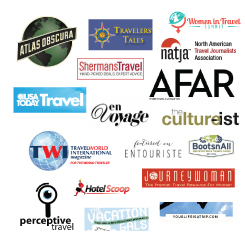 What’s your favorite travel blog logo? If you’ve designed your own logo, was your process as beautifully messy as mine? A big thanks to Krizzy Designs for letting me try my crazy ideas out, for letting me try more crazy ideas out, and then for finally setting up and coding bon touriste!